Subalpine, alpine. Meadows, openings. Summer, fall. 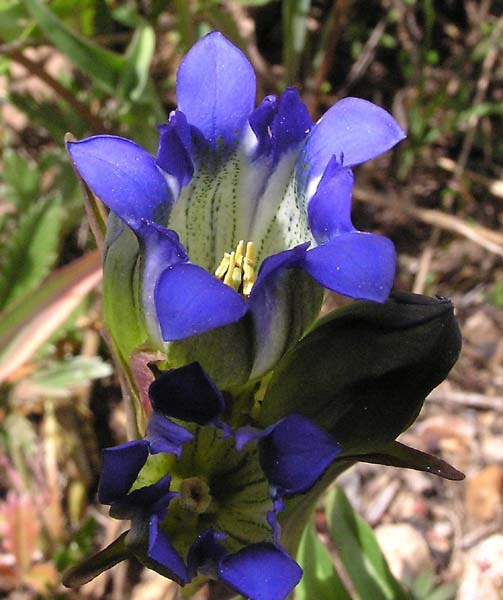 Mountain Gentian is found scattered in dry meadows. It often pokes out of grasses with its brilliant blue/purple flower. The five petals are separated by unusual, slightly toothed projections. Plants range from a few inches tall on alpine tundra to eighteen inches tall on richer soils in subalpine meadows. Flower petals may be rounded or pointed. Sunshine opens the tightly closed flower wide and deep, giving it a second common name, "Bottle Gentian". "Pneumo" is Greek for "the wind" or "lungs" and "anthus" is Greek for "flower". Charles Parry made the first collection of this plant in Colorado in 1862 and George Engelmann named the plant for Parry in 1863.